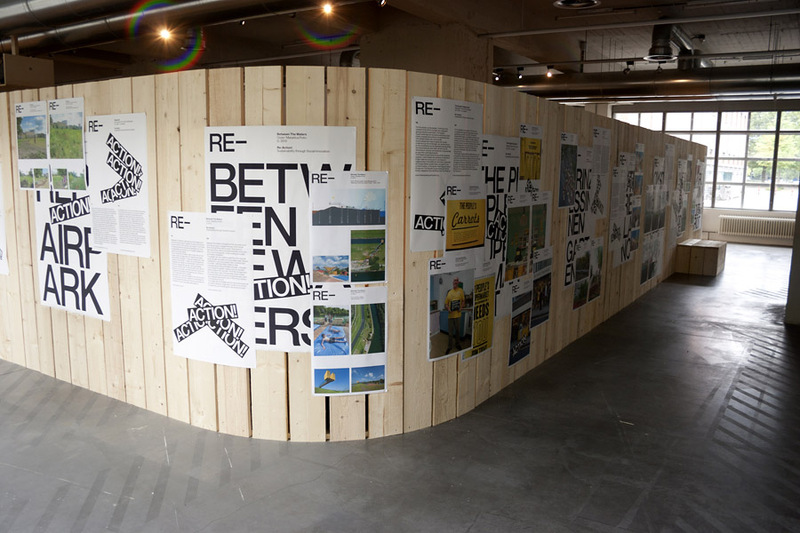 ‘Re-Action: Sustainability through Social Innovation’ was an exhibition curated by Linde Dorenbosch (of Re-Centre, a so-called ‘Euregional’ center for sustainable design), revolving around twenty different ‘case studies’: examples of local, sustainable, ‘bottom-up’ initiatives. 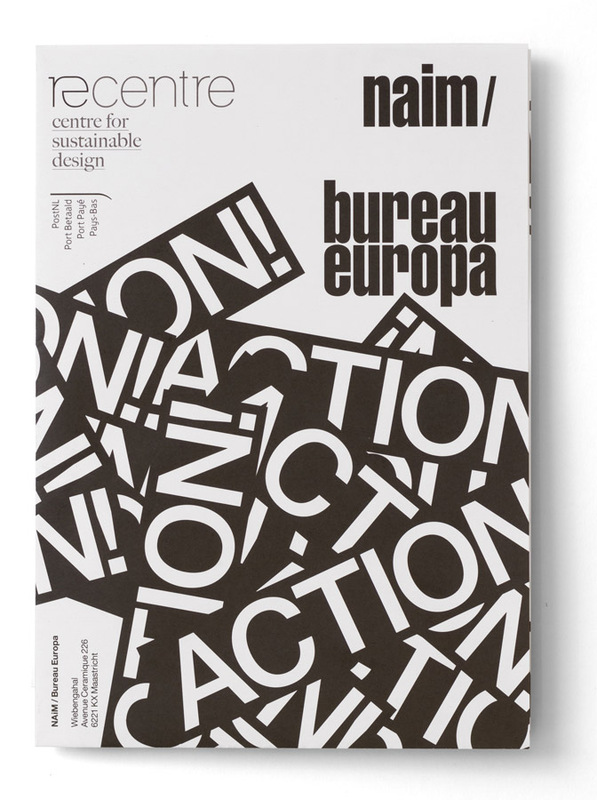 More information about the exhibition can be found here. 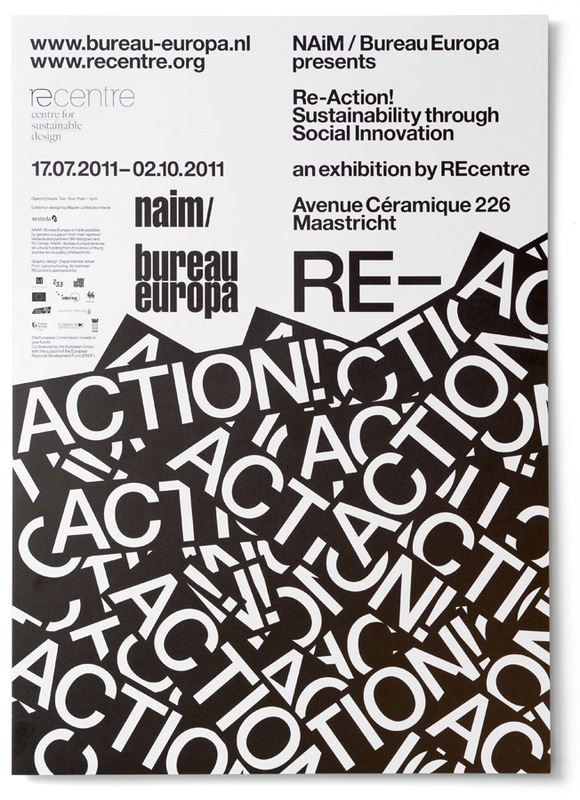 When it comes to NAiM / Bureau Europa, the spatial exhibition design is usually done by EventArchitectuur, after which we typically come up with a ‘context-sensitive’ graphic intervention – a site-specific way in which we distribute all the information in the exhibition, often in the form of prints (which we usually install ourselves). 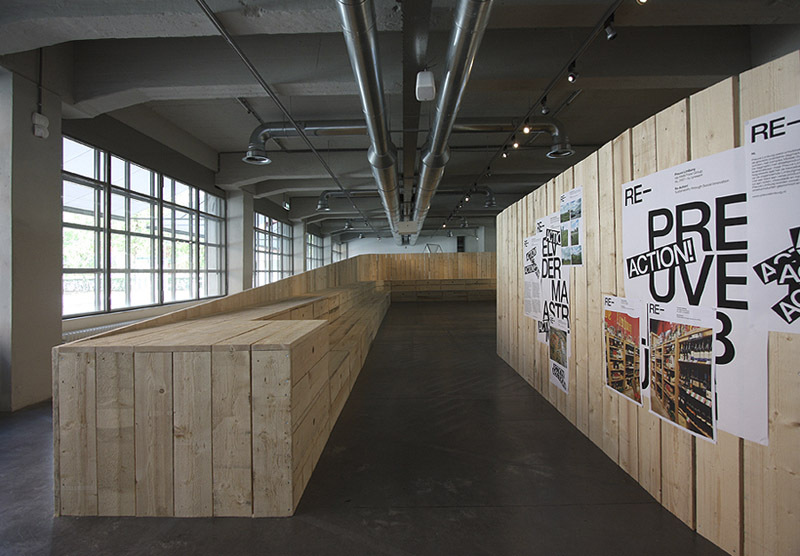 In the case of ‘Re-Action’, this situation was slightly different, in the sense that the exhibition design was not done by EventArchitectuur, but by Maurer United Architects; but other than that, the working method remained the same. 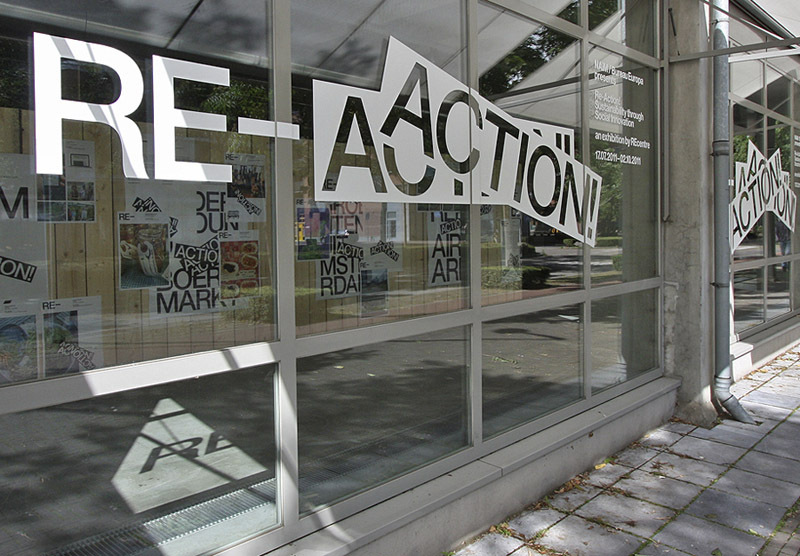 Maurer United Architects came up with a spatial construction, after which we came up with a graphic answer (or better said, reaction). For ‘Re-Action’, Maurer United Architects built a long, multi-functional, spiraling wooden fence. 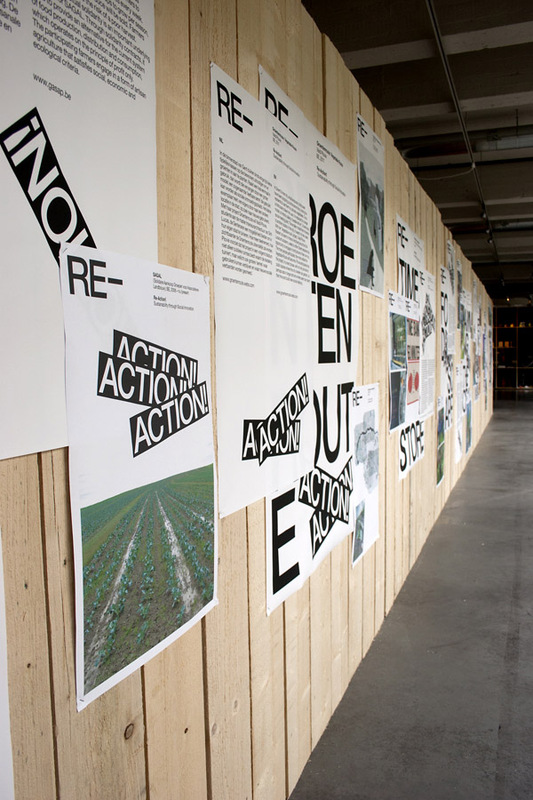 Our idea was to show the ‘case studies’ as posters, pasted onto this fence. 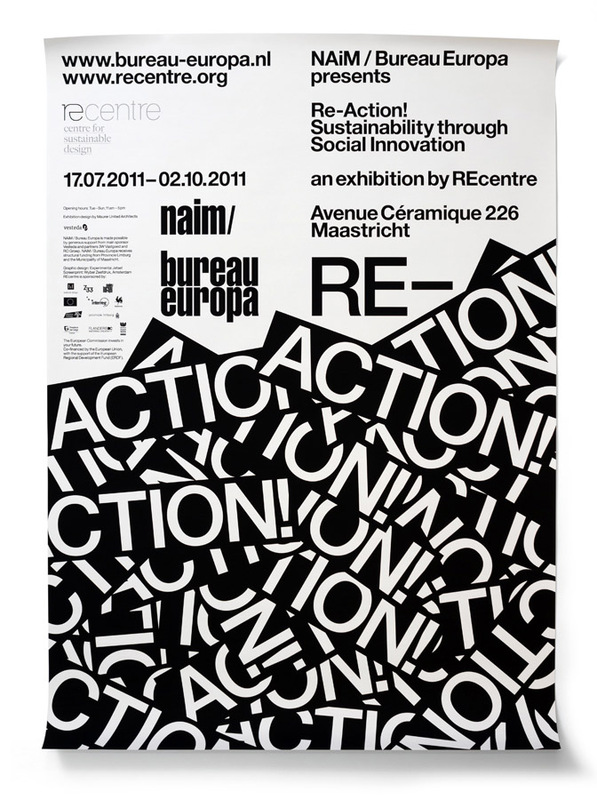 We thought the format of posters would really underline the directness and urgency of the presented initiatives. 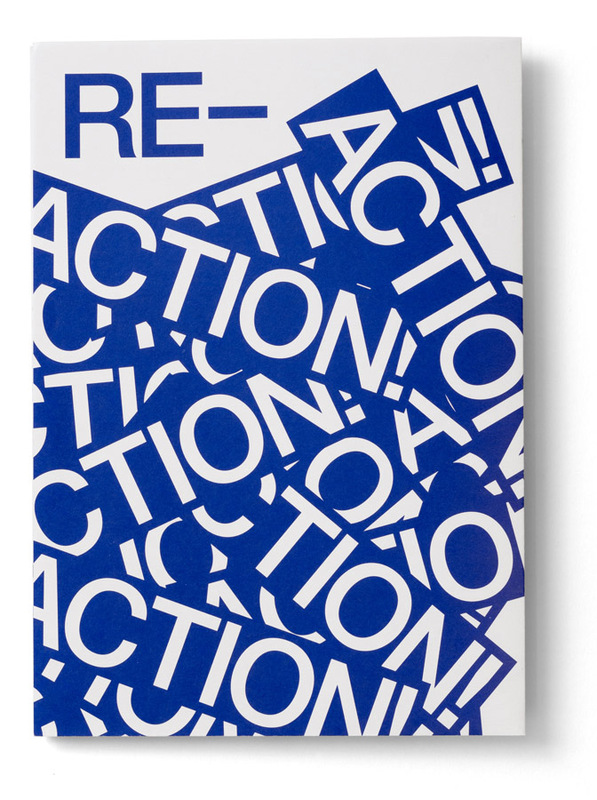 Furthermore, by letting the posters overlap, we would graphically refer to the idea of ‘reaction’ – after all, overlapping is a form of reacting, in the most material sense of the word. We presented every ‘case study’ as a ‘cluster’ of overlapping posters, which resulted in a wooden wall filled with twenty (or so) ‘clusters’. Our initially plan was to wheatpaste these posters directly to the fence, which we actually did. However, when we returned the next day, we found all the posters on the ground; apparently, the roughness of the wood sucked the glue completely dry. Since the exhibition was about to open the next day, we had to move quickly, so we decided to simply staple the posters against the fence. Which turned out to be a fitting solution as well – we were immediately reminded of these telephone poles you sometimes come across in SF and LA, completely filled with overlapping flyers, stapled to the pole. So the stapling made sense. We actually designed two different versions of the invitation. 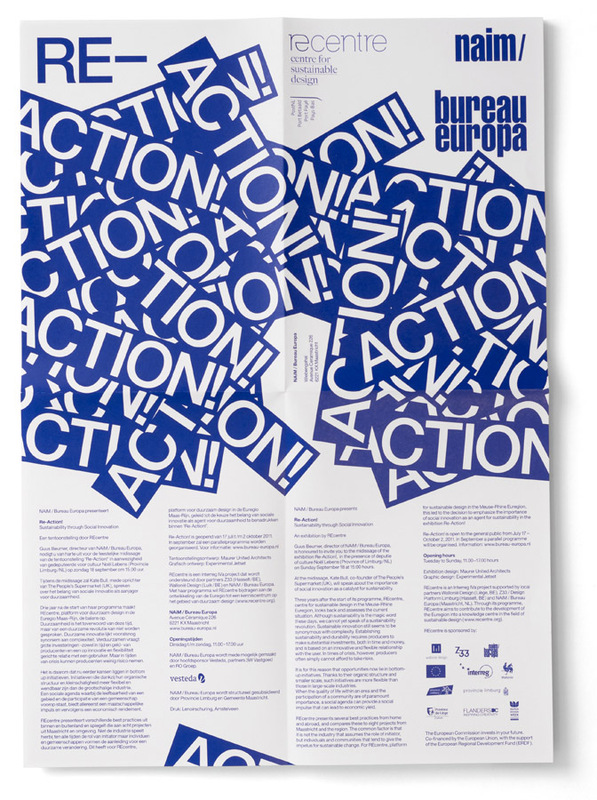 The first version (printed in black) was a more general announcement of the exhibition, while the second version (printed in blue) was a specific invitation to the opening reception. 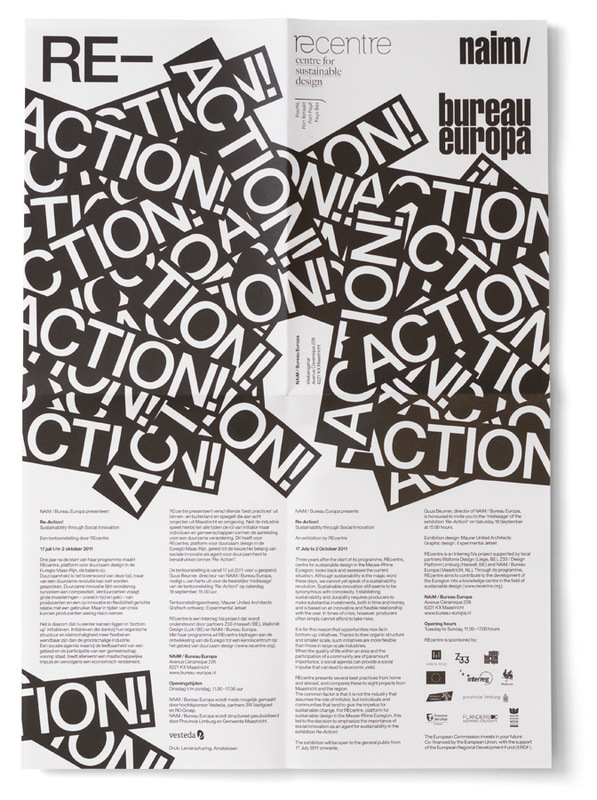 Apart from the posters and the invitations, we also designed a couple of newspaper- and magazine-adverts (not shown here), a few website banners (not shown here), and some window lettering (shown here). 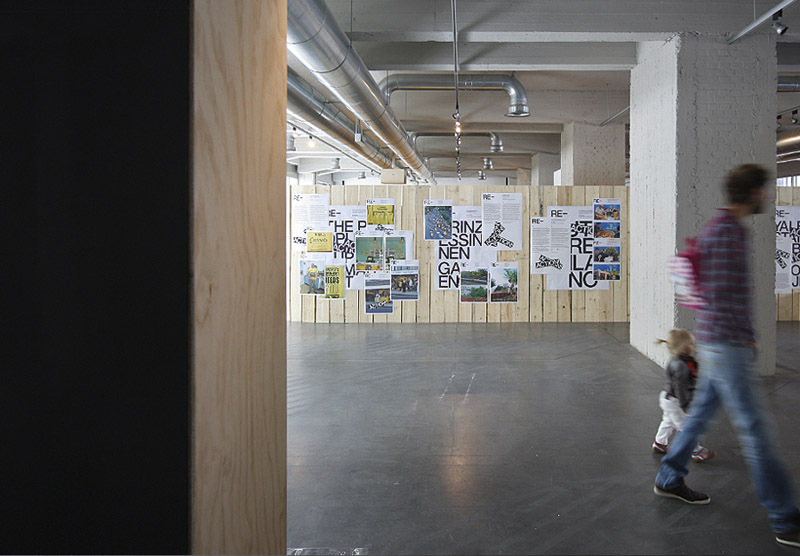 Most of the photos of the exhibition (the ‘installation views’, so to speak) were taken by Johannes Schwartz, but we also included some photos we made ourselves.